Both devices feature xenon flash and testing their low-light performance is a must. We tried out two scenarios - flash off and flash on. We'll start with the flash off shots as they will give us an idea of how each camera does in poor lighting conditions. We took photos both with night mode off and on, as night mode can improve but also degrade image quality, depending on the situation (it slows the shutter speed, which improves quality, but increases the chance of camera shake). This is why we took several shots and we've selected both the best and the worst to judge if the risk is worth it. We were standing about 1.2m (4 feet) from the chart when we took the photos. The Samsung Galaxy Camera proved to be very good in the dark - it took very acceptable even without night mode and there's very little difference between the best and the worst shots is minimal. Night mode takes several photos in quick succession and stitches them together. This means you have to hold steady for longer - both you and your subject (landscapes are still, but a person might move). Night mode does reduce noise a bit and practically eliminates the difference between the best and worst samples, but again, it's only good if your subject is sitting still. The Nokia 808 PureView struggled more with this assignment. Note that its Night mode works only in 5MP 16:9 mode, you can't use it for 8MP or 4:3 photos. Photos without Night mode were shot at 8MP. The 808 PureView used shutter speed as low as 1/8s (both with and without Night mode), while the Galaxy Camera settled for 1/15s. This makes the effects of hand shake much more noticeable. Overall, if you have steady hands and you're shooting landscapes it pays to switch Night mode on, otherwise you better take your chances without it. You can also have a look at the full resolution shots. 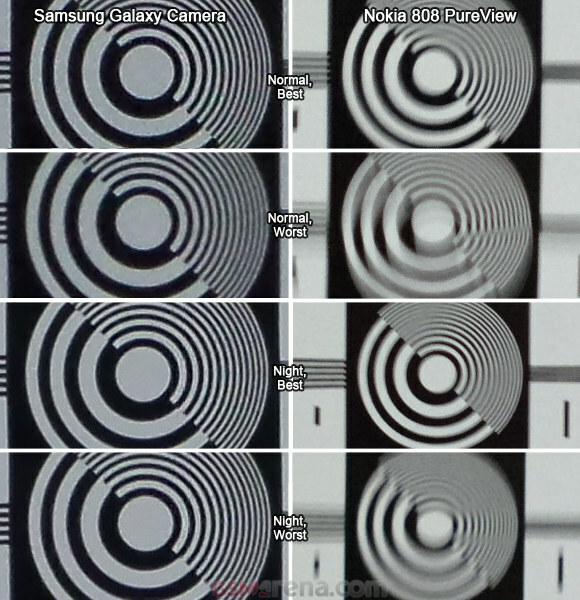 Of course, both the Samsung Galaxy Camera and the Nokia 808 PureView have xenon flashes - a rarity among mobile phones, but standard fare for point-and-shoots. We took a step back (we were 2.2m / 7.2 feet from the chart) and enabled flash. With it, both devices consistently took good shots, so we're only showing the best photos here. Below is an image with 100% crops along with an overview of the full image. 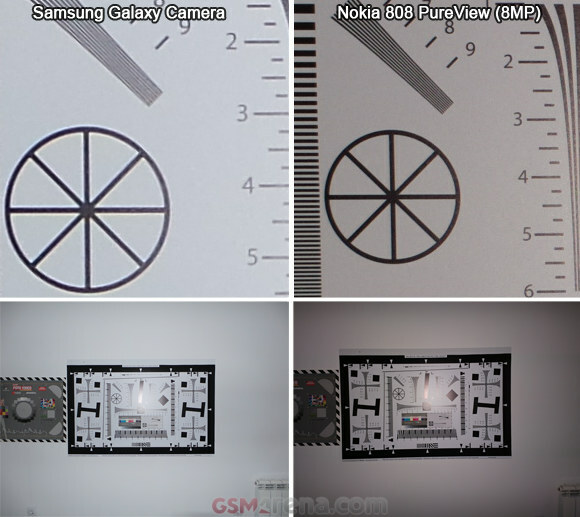 The 808 PureView photos have only half the resolution of the Galaxy Camera photos, but they have more detail, even though the Galaxy photos have very clear traces of oversharpening. The smaller xenon flash inside the Nokia, however, provided less illumination and it was focused at the center of the image. 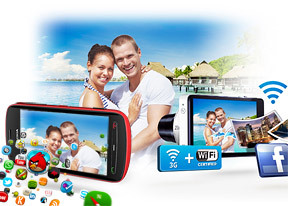 The Samsung Galaxy Camera has a brighter flash that lights the scene evenly. The Samsung camera offered better (if a bit too cold) white balance too, the 808 photos came out with a slight tint. So, Nokia 808 PureView photos taken in low light with xenon flash on won't be as well lit, but they'll usually have more resolved detail. The Galaxy Camera does noticeably better in terms of lighting the scene, but the image quality it produced is a little worse. Full resolution shots with xenon flash are available below. While not perfect, the Samsung Galaxy Camera takes the win here - it performs tangibly better with flash off and its more powerful flash leads to more pleasing illumination of the shots when it is on. The Nokia 808 PureView doesn't do too hot with flash off, but under the right circumstances you can tease out more resolved detail from it when flash is on.